Can you believe we’re only three weeks away from Christmas? Time flies in the holiday season. Today we’d like to equip you with free coloring pages to be used for early arriver activities, kidmin Christmas parties, take-home activities for your little ones, and just plain fun. 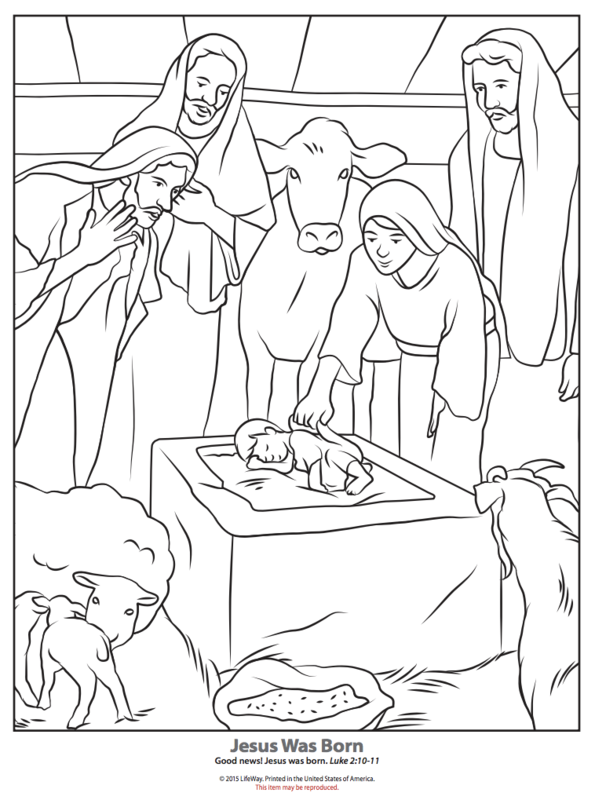 Here are coloring pages from Bible Studies For Life, The Gospel Project, and Explore the Bible depicting the true reason for the season. Click on the images to begin your download. Click here to download a coloring page from Explore the Bible. 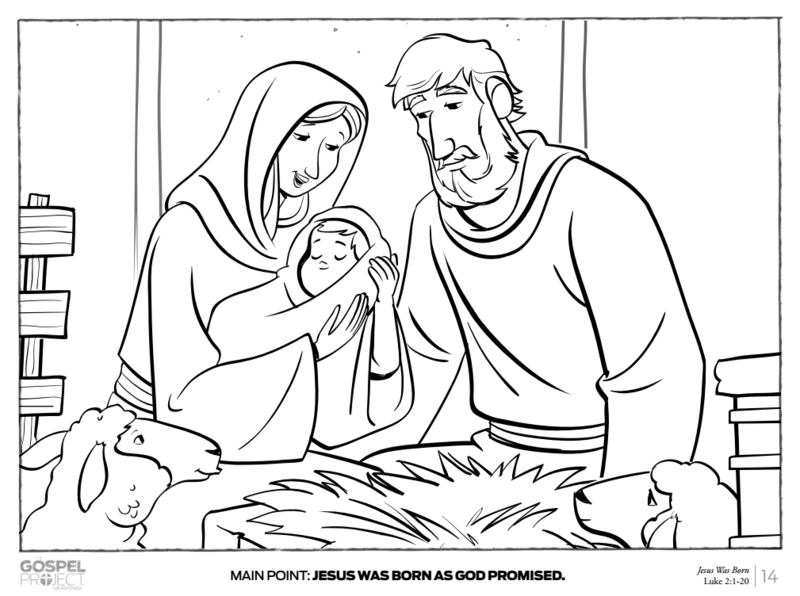 Click here to download a coloring page from The Gospel Project. 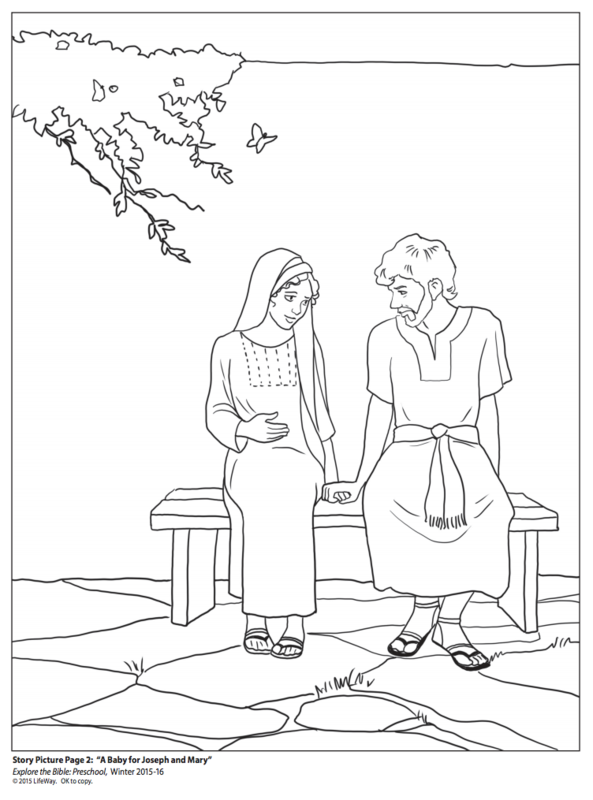 Click here to download coloring pages from Bible Studies For Life. We’ve gathered up the top ten ranking Christmas-themed blog posts from years past! Click on the titles below to read the posts in their entirety. Happy reading! 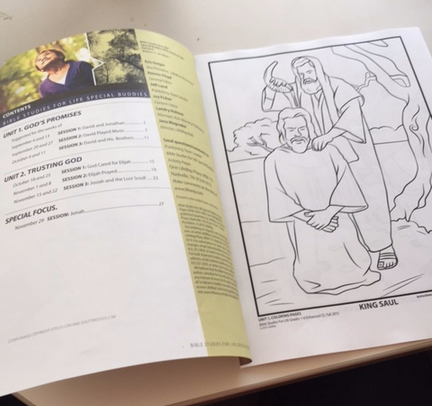 I was recently looking through the coloring pages for Fall 2015 and thinking that I wished we had time in our Sunday School class to use them. We have a class full of 2nd Graders each week and we are generally too busy for coloring pages. Then it hit me—I could make them coloring books! Each quarter we get our Kids Activity Pages and we pretty much just throw away the cover page. I realized that would be a great cover page for a coloring book. Then I printed off all of the coloring pages for the quarter and neatly stacked the activity page cover on top. I stapled in three places along the left border and BAM! Instant coloring book! I liked my coloring book so much that I had to color one of the pages. Coloring books are really popular right now. Even adults have their own coloring books. I’ve even heard of coloring clubs! If you don’t use the coloring pages that come with your curriculum in your class, consider creating coloring books for your kids. 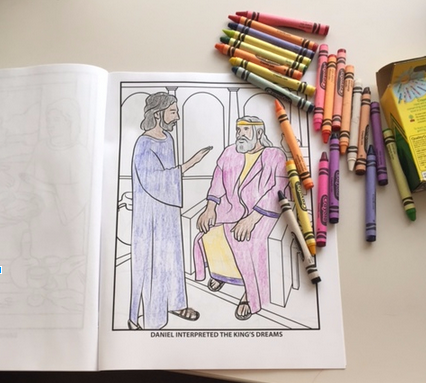 These would be great for activity books during “big church”, or for families to work on together at home and have conversations about the Bible story! So, go ahead, make a coloring book and enjoy some time coloring! At LifeWay Kids, we love children and are dedicated to the ministry of resourcing the church to serve them well. For years KMC, LifeWay’s Kids Ministry Conference, has been the place for children’s pastors, leaders, teachers and volunteers to come for information, instruction and inspiration so they might be well equipped for the work of kids ministry. We are very aware that kids do not stop being children when they leave the sixth grade, and that ministry to kids continues through middle school, junior high and high school. While kids and students do have different, specific needs, the child who grows through the programs within a church needs to feel a sense of consistency and continuity within that church. We at LifeWay Kids believe that we need to walk with kids and families to etch the Word of God onto the hearts and minds of children throughout their entire childhood. The church cannot afford to minister in silos. It is time for us to think beyond our departments with a larger view of the role of the church as we train up our children in the way they should go. Many churches are moving to a family ministry model in how they structure their staffs. Some call it NextGen, others call it Family Ministry. Whatever you call it, there is a broad trend towards having a single pastor over all kids: birth through high school; and more and more ministry teams want to attend conferences together so they can strategize together. We want to come alongside you as you equip families and minister to children. So, in order to serve you in the most effective ways possible, we are expanding the LifeWay Kids Ministry Conference to include middle school and high school ministry; to welcome in Next Gen, Student, and Family Ministry leaders & teams. Next year we will unveil a brand new conference; one that includes everything that is currently KMC, but that also broadens its reach to serve anyone ministering to families. Next Fall, KMC becomes… ETCH. ETCH stands for Equipping the Church and Home. This new Family Ministry Conference will excite, inspire, and engage your Kids, Student, Next Gen, and Family Ministry teams. We invite you to join us next fall, in Nashville, as we come together as one big, giant family, for ETCH. My observation: Most KidMin leaders are super creative but lack gifting in details or moving past the big idea. (My apologies to the other 2 people out there who don’t fit that stereotype… I love details). Determine the Purpose for the Event: Ask the simple question, “Why are we even considering this event?” Too many times we do events that have no purpose and bring no real benefit to our ministry. It’s important to know the “why” before you get too deep into the planning. Identify the Target Audience: Age appropriateness is important for events, too. Obviously, every event can’t be narrowly targeted for a specific age group but I think it’s valuable to recognize the audience that will be included and make sure you plan accordingly (generally speaking 4th graders don’t enjoy the same activities that 4 year olds do). Develop Goals: It’s been said, “If you don’t know where you’re going, you won’t know if you get there” and that’s true for events. What do you hope to achieve? What would make the event considered a success? Are there attendance goals? Ministry Goals? Develop your goals and steps to achieve them. Decide on a Date: Check the larger “church” calendar. Consider community events. Consider holidays, vacations, and other traditions. Ideally, major events take 4-6 months of planning. Enlist a Team: Enlist folks who have varying skills. Be careful to not enlist folks “just like you.” Do that, and you’ll find yourself sinking at the end. Consider enlisting an “event director/manager” for major events like VBS, Camp, and Fall Festival. Remember, our work as KidMin leaders is to “equip the saints” (Ephesians 4:12) not do it all ourselves. Develop a Budget: Line item budgeting based on detailed planning is best. Don’t guess, that seldom works. Often this is where a good event goes bad, quickly. Create a Timeline: Again, all the detail folks love this but the bulk of my friends would just as soon shoot themselves in the foot. Take the time to chart it all out. Include essential decisions and progress reports to reach the goals. Communicate to everyone involved the timeline and team members expectations. Market the Event: If they don’t know about the event chances are they won’t attend (actually a very good chance). Identify effective methods for communicating the event and don’t forget social media (but don’t fully rely on it either). If you’re planning a really large event (like VBS) make sure a “save the date” has been announced 6-12 months before the actual event. Consider using the theme (if there is one) to help with promotion. Evaluate the Event: Be honest with yourself and allow for honesty from team members and participants. If it didn’t work, admit it, remember it, and put it writing. Keep a record of the super great things too… especially if you plan to do the event again. If you’re like me there will be a lot of water flow under your bridge between now and “the next time” so keep good records. The definition of insanity it doing the same thing over and over and expecting different results. Don’t be insane. Evaluate and learn. The following blog post was written by Kelly Minter, one of the main stage speakers for the 2015 Kids Ministry Conference. First off, I’m looking so forward to being part of LifeWay’s Kids Ministry Conference. If you’re involved in kids ministry of any kind I know you’ll be blessed by this experience. Plus, if you work with kids on a regular basis you probably need this experience. Here’s what I’m looking forward to: The people speaking and singing at this event. Counselors like my dear friends Sissy Goff and David Thomas who have over forty years combined experience counseling children from a biblical foundation. The music and artistry of Cindy Morgan and Andrew Greer—just wait, I can’t possibly overstate how much they are going to blow us all away. The two of them sang on a record I just released and—I’m serious—they’re crazy good. Others like Ed Stetzer who bring a wealth of research and knowledge on the state of the church in America along with vetted ministry practices. And these are just a handful of those who will be sharing the platform—I know you will walk away with renewed vision. 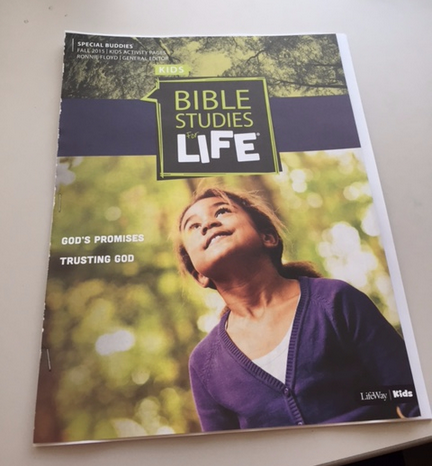 Lastly, I’ve been an author with LifeWay for almost ten years and am always grateful for their commitment to God’s Word and His renown. With LifeWay, you can be sure that what you’re in for will be quality. My Mom and Dad founded a church in Northern Virginia a year before I was born and are still ministering there. As I was growing up and still today the Word of God spills out of their lives and onto those around them. This wasn’t just for Sunday morning. As in this passage teaching God’s Word to our children is to be a habitual, continual, natural way of life that the younger generation can’t help but receive from us. I look forward to spending time in the Scriptures as we “walk along the road” together in October. 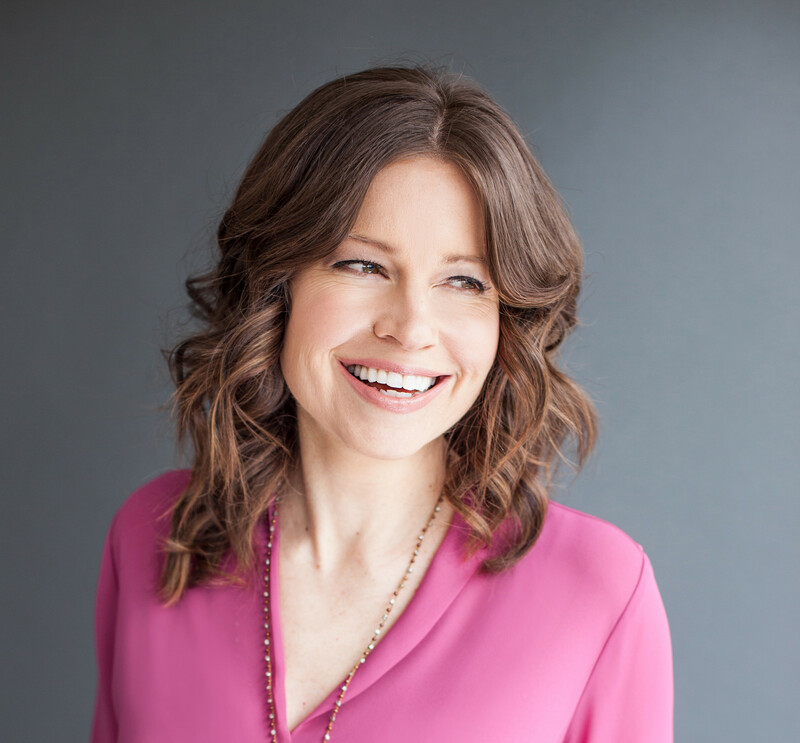 Kelly Minter speaks, writes, and sings around the world. She’s written a number of books, including a series of four Bible studies for women, and has recorded several albums. Kelly is deeply passionate about serving the poor and the forgotten through the work of Justice and Mercy International and particularly enjoys spending her free time with friends and family or in the large garden she has planted in her backyard in Nashville, Tenn.
Feel like you need to boost your creativity? Looming deadlines, uninspired projects, and overstuffed inboxes are enough to dull anyone’s creative edge. Here are 12 ways to sharpen your creativity. Keep learning. Being a perpetual student is critical for creativity. Take a class online or at a local university. Learn a new language using a free app like Duolingo. Try a different medium. If you’re a writer, take up photography. If you’re a painter, try cake decorating. Read. Read for pleasure, general news, or industry news. Adam York, former content editor for LifeWay’s Threads, says he makes a point every day to read blogs, digital magazines, and websites that relate to writing or to his work with Millennials and young adults. Another way to keep the creativity flowing is to read beyond what you normally read. If you’re the type who only reads non-fiction, pick up a spy novel or book of short stories. Stretch your mind by reading something you don’t normally read. Change your environment. Try moving your furniture around at home or rearrange the items on your desk. Drive a different route to work, to church, or to the store. You’ll be amazed at what you notice when you switch up your normal surroundings or routine. Get moving. Bestselling author Seth Godin suggests taking regular 10-minute walks and coming back with at least five written ideas on how to improve what you offer the world. Spend time with other creatives, thinkers, and visionaries. Bruce Nussbaum, author of Creative Intelligence refers to this as a creativity circle. I just call them friends. Try to find people who work outside your department or company and have diverse backgrounds and experiences. Meet on a regular basis over coffee, lunch, or dinner. Talk about projects you’re working on, share ideas and challenges. Surrounding yourself with smart, creative people will challenge you and spark new ideas. Manage your time. You need time to work, to create. If you’re going to do meaningful work, you need time to do it. Time is limited, so manage your time to its maximum potential. That means having to say no to some good things. Unplug regularly. Allow time for thoughtful contemplation. Unplug from all your social media accounts, email, and phone, and enjoy a little solitude. It’s difficult for creative ideas to germinate and grow if you have constant distractions. Ignore your inner critic. You know, it’s that voice inside that says, “Oh, that’s a dumb idea, don’t tell anyone that. Everyone will hate it.” Try not to let your inner critic dampen your creativity. You never know when a dumb idea might turn into a great one. Do something to serve someone else. Creative work can be all-consuming, and it’s easy to become so involved in our work that we forget about the world around us. Taking a break from our own concerns can help us tap into insights about the people around us. Carol Pipes is Manager of Editorial Services at LifeWay Christian Resources.